Contributed by and posted with permission of publisher. Please support this online re-printing by ordering a copy of the book. Audio versions: 6-part mp3, 147 mins. December 28, 1911, in Syria, "by the pen of Mirza Abul Fazl Gulpaygan." Evangelical Christendom (London) Sept.-Oct. 1911. The brilliant proof / Mírzá Abu'l-Fadl Gulpáygání. "Bahaism  a warning / by Peter Z. Easton": p.
1. Bahaism. 2. Easton, Peter Z. (Peter Zacceus), 1846-1915. Bahaism. I. Easton, Peter Z. (Peter Zacceus), 1846-1915. Mírzá Abu'l-Fadl Gulpáygání (1844-1914) is known as the greatest scholar the Bahá'í world has yet produced, and this reputation is well deserved. He is the author of numerous books and essays which blend into harmony the weight of his traditional Muslim education and the light of his discovery of the Bahá'í sacred writings. Approaching his scholarly work on the Bahá'í Faith, even now  some one hundred years after much of it was written, the reader is startled by the modernity of Abu'l-Fadl's thought and the liberal, universal direction of his writings. His ideas continue to challenge Bahá'ís to this day. Mírzá Abu'l-Fadl was born in 1844, in the town of Gulpáygán, in central Iran. His given name was Muhammad, the son of Muhammad-Ridá. A brilliant student, he attended traditional Muslim schools in his hometown, went on to higher theological studies in Isfahan, and eventually in Tehran. He distinguished himself and rose into the highest ranks of the Shí'í Muslim clergy. Despite this position, his interest in the Bahá'í Faith was sparked by the teaching efforts of an ordinary blacksmith. The story is well known and often told, but it is worth retelling: It seems that Abu'l-Fadl's donkey needed reshoding and, as he waited for the work to be done, the blacksmith approached him. "Mullá, I have heard of some holy traditions of the blessed Imáms which I have difficulty understanding. Can you help me?" Abu'l-Fadl agreed to hear the man's questions. "I have heard the mullás quoting a holy tradition on the subject of God's mercy in sending the rains: that every drop of rain is entrusted to an angel of God who carries it down to earth. Is that tradition true?" "Again I have heard," the blacksmith continued, "on the subject of the ritual uncleanliness of dogs: there is a holy tradition that no angel will visit the house where dogs are kept. Is this true?" "Yes," Abu'l-Fadl answered, once again. "Then, how is it," the blacksmith asked, "that rain falls on the houses that have dogs? The rains, when they come, fall everywhere alike." Of course, the learned scholar had no answer for the blacksmith's questions, which suddenly no longer seemed innocent. Abu'l-Fadl was both perturbed and astonished. How could this ignorant blacksmith so easily have trapped him with his riddles? Abu'l-Fadl's companions urged him to pay no attention to the man. They explained that he was only a "misguided Bábí." But for Abu'l-Fadl, the encounter was important. Naturally, he had known of the Bahá'í Faith and had been ap- proached by Bahá'í teachers before. But this brief conversation, in which he was defeated in argument by a blacksmith, alerted him to the subtlety of the Bahá'í message  and to the bankruptcy of a narrow, literal, unthinking reliance on scripture and tradition. He began to study the Bahá'í religion seriously. In 1876, he found his faith and became a believer. There followed, for Abu'l-Fadl, a lifetime of service to his new religion. First, at the direction of Bahá'u'lláh himself, he traveled in Iran, and then in the Russian realms of Ashkabad, Sam-arqand, and Bukhara. Later, 'Abdu'l-Bahá called him to Palestine, to Cairo, and then to New York. But, Bahá'ís hhetic opinion piece ices to the Faith were greater, Abu'l-Fadl's or those of the blacksmith who taught him the Message. This treatise, The Brilliant Proof, is the product of the waning years of Mírzá Abu'l-Fadl's life. In this essay, we find his thought at its most mature and its most insightful. We also find his approach at its most expansive and all-encompassing. The catalyst for this book was an article written in an English church journal by Peter Z. Easton, a Presbyterian minister who had been a missionary to Iran since 1871. Little is known about Rev. Easton, except that he was a man of extremely conservative views  so conservative, in fact, that they eventually impelled him to abandon his own Presbyterian denomination and to seek the company of more backward-looking Christian sects. Rev. Easton was born on May 30, 1846, in New York City of parents from English stock. He attended the College of the City of New York during the Civil War, from 1860 to 1865, and received a Bachelor of Arts degree. Going on to the Union Seminary, he pursued his career as a Christian minister. In December 1868, while still a seminarian, he married his wife, Maria E. Burnham, who was nearly three years older than he; and they eventually had seven children. In 1871, he completed his studies and was appointed to the Tabriz mission in western Iran; he was formally ordained in the Presbytery of New York on April 28, 1872, and he apparently arrived in Persia in 1873. These visitors [to 'Abdu'l-Bahá] represented a spectrum of humanity. Among them were leading men of all Faiths. Most of [the inquirers] had broad sympathies, liberal minds. There were also some who were bigoted and had narrow outlooks. Of the latter category was the Reverend Peter Z. Easton. He called to meet 'Abdu'l-Bahá on September 21st . This interview was followed by a virulent and venomous attack on the Bahá'í Faith. Referring to 'Abdu'l-Bahá, he wrote in the English Churchman: "I found him to answer to Dr. H. H. Jessup's description of him as a man of great affability and courtesy. He was glad to meet with an Occidental, who could talk with him in Tartar Turkish, the language of [Azarbayjan], Persia, in which and the adjoining Caucasus I have been labouring as a missionary since 1873." Then he complained that to his query 'Abdu'l-Bahá had given no answer, that He had changed the subject. And what was his query? What did 'Abdu'l-Bahá have "to add to the New Testament teachings of repentance toward God and faith toward our Lord Jesus Christ, the Way, the Truth and the Life, through whom alone we can come to the Father." Apparently the Reverend Peter Z. Easton wanted a slanging match. Having failed to obtain the answer he desired, the irate cleric said that he had to seek it elsewhere. Sydney Sprague in his Story of the Bahá'í Movement had referred to Gobineau. Now, Mr. Easton would find his answer. And there it was in the pages of Religions et philosophies dans l'asie centrale where Gobineau had characterized the Bábí Faith as "the latest expression of an eclectic evolution, growing out of the innate pantheism of the Iranian mind"; and so Mr. Easton was in full gallop: "Here, then, we have a very important statement in regard to the character of the movement. It is a pantheistic, not a Christian, nor even a Mohammedan movement, one of a long series of such movements, beginning with the very beginning of Persian history and continuing to the present day, a movement akin likewise to the pantheistic sects of other lands, such as Mormons, Spiritists, Theosophists, Christian Scientists, etc." Mr. Easton did have astonishing views. To put Christian Scientists in the category of pantheists is no mean feat. The mind reels. Mr. Easton even formulated a definition of pantheism. But he was not a competent theologian. Next he proceeded to defame Bahá'u'lláh, and waxed so bold as to say: "In short, he was a moral and spiritual monster, who exalted himself against all that is called God or that is worshipped. To become a Bahai means to put this anti-Christ in the place of the God and Father of our Lord Jesus Christ. This is what the people of Great Britain are now invited to do." Then, after presenting some dubious historical analogies, Mr. Easton was moved to express his personal hope and concern for 'Abdu'l-Bahá: "I am sorry for Abdul Baha. Brought up in this terrible system, he is entangled in its meshes. From what I have heard of late, I would fain hope that some glimmerings of light have dawned upon him. May God in great mercy open his eyes to behold the truth as it is in Jesus . . . "
Mr. Easton was not content with this one article. He took his invective to the pages of Evangelical Christendom. Mírzá Abu'l-Fadl was then living in Beirut. He was apprised of the contents of Mr. Easton's second article by students at the Syrian Protestant College [the American University of Beirut since 1920]. From his sick-bed he wrote one of the most effective treatises that ever came from his powerful pen, in answer to the Reverend Peter Z. Easton. This was Burhán-i Lámi  The Brilliant Proof  translated into English at the instruction of 'Abdu'l-Bahá and published in Chicago. This story provides the background for the present volume. Rev. Easton's Evangelical Christian article is reproduced as an appendix to this book. It provides the context for Mírzá Abu'l-Fadl's powerful rebuttal.
. . . This evening, we have in the pulpit of the City Temple the leader of one of the most remarkable religious movements of this or any age, a movement which includes, I understand, at least three million souls. The Bahá'í movement, as it is called, in Hither Asia rose on that soil just as spontaneously as Christianity rose in the middle territories adjoining, and that faith  which, by the way, is very closely akin to, I think I might say identical with, the spiritual purpose of Christianity  that movement stands for the spiritual unity of mankind; it stands for universal peace among the nations. These are good things, and the man who teaches them and commends them to three millions of followers must be a good man as well as a great [man]. 'Abdu'l-Bahá is on a visit to this country  a private visit  but he wished to see the City Temple; and I think I am right in saying for the first time in his life he has consented to lift up his voice in public. He does not address public meetings, he does not preach sermons; he is just a religious teacher. He spent forty years in prison for his faith, and from his prison directed the efforts of his followers. There is not much in the way of organization, but simple trust in the Spirit of God. We, as followers of the Lord Jesus Christ, who is to us and always will be the Light of the World, view with sympathy and respect every movement of the Spirit of God in the experience of mankind, and therefore we give greeting to 'Abdu'l-Bahá  I don't know whether I could say in the name of the whole Christian community  that may be too much  but I think in the name of all who share the spirit of our Master, and are trying to live their lives in that spirit. 'Abdu'l-Bahá, I think, intends to say a word or two in response to this greeting that I address to him in your name. Cordial receptions of this kind by the liberal churches outraged Evangelical opinion in Britain, and Rev. Easton's article was published a few weeks later. Such a development was to be expected, of course, but Mírzá Abu'l-Fadl appears to have been genuinely shocked by the viciousness of Easton's attack. He begins his reply with repeated admonitions against libel, execration, falsehood, and calumny. He establishes the standard for judging the Bahá'í message as the one that Christ offers in the Gospels for judging true prophets from false: "By their fruits shall ye know them." Abu'l-Fadl goes on to summarize as four the arguments against the Bahá'í teachings which Easton raises in his article: 1) that Christian clergy friendly toward 'Abdu'l-Bahá have failed to consult the missionaries in Syria, Palestine, and Persia to learn of the true character of Bahá'u'lláh and his religion; 2) that the teachings of Bahá'u'lláh are pantheistic; 3) that the Bahá'í teachings advocate undemocratic government; and, 4) that the Bahá'í Faith offers no teachings beyond those that are to be found in Christianity, in any case. This is a rather loose and contradictory collection of objections, but Abu'l-Fadl takes each objection seriously. He addresses them one by one and dismisses them. the establishment of the House of Justice and the institution of democratic, constitutional government. Then, unable to contain himself to just nine, Abu'l-Fadl adds a tenth principle: the broad distribution of wealth throughout society. Now, this is not the list of ten or twelve "Basic Principles" that was to develop a few years later in Bahá'í history and become the basis for so many standard presentations of the Bahá'í Faith. It does come pretty close, however. Missing are the principles of a universal auxiliary language and the independent investigation of truth, but the rest of the familiar list is either expressed or im-plied. The whole emphasis of Abu'l-Fadl's choice of teachings is on the unity of humanity and on those laws of Bahá'u'lláh which emphasize harmony and reconciliation among all peoples. The universal nature of the Bahá'í Faith is clearly the focus of Abu'l-Fadl's formulation of new teachings in The Brilliant Proof. In what stark contrast it stands to Rev. Easton's narrow and bigoted sectarianism. Abu'l-Fadl wrote his treatise in just two days, despite his illness in Beirut. When it was presented to 'Abdu'l-Bahá, who was then traveling in America, he approved of it and ordered that it should be published immediately. He praised the eloquence of the essay and accepted all its arguments. It was 'Abdu'l-Bahá who gave the work its distinctive title. I took the article to Mírzá Abu'l-Fadl, and I explained the situation. I gave him a verbal summary of the arguments in it. Abu'l-Fadl was, at this time, sick in bed in the hotel. He got up from bed, pulled his cloak over his shoulders, sat down, and said: "Bring paper and pen so that I can give him an answer." He dictated to me for about an hour, and I wrote down his words. While talking, he suddenly became very weak and sick. He lay down and bade me goodbye, saying: "When I feel better, I will write the answer myself." The next day, when I went to the hotel, he said: "I have written the answer to Peter Z. Easton. It is ready. Mail this to 'Abdu'l-Bahá so that he can, in his wisdom, decide what to do with it. I mailed the essay to the United States. 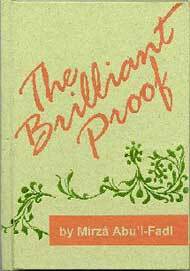 'Abdu'l-Bahá published an English translation, along with the original Persian, in a pamphlet and titled it The Brilliant Proof. The publication of The Brilliant Proof in 1912, marks the end of an early era of Bahá'í teaching in the West. For as 'Abdu'l-Bahá continued his journeys in the United States and Canada, he delivered hundreds of public talks and private addresses which were tailored to Western audiences. The fresh outpouring of teachings which resulted from these encounters produced a new Bahá'í literature of the words of 'Abdu'l-Bahá in the West, and this literature has continued to fascinate and occupy Bahá'ís as a source of study up to the present. The Brilliant Proof came at the end of Abu'l-Fadl's career, being his last major publication. He died on January 21, 1914, in Cairo. It also heralded the end of Rev. Easton's career. He had passed away just four months earlier on September 22, 1913. Tradition (hadíth), a saying attributed to the Prophet Muhammad or one of the Imáms of Shí'ih Islam. Such sayings have varying degrees of authenticity-ranging from the historically reliable to the obviously manufactured. H. M. Balyuzi, `Abdu'l-Bahá: The Centre of the Covenant (Oxford: George Ronald, 1971) pp. 149-151. See `Abdu'l-Bahá in London: Addresses and Notes of Conversations, comp. by Eric Hammond (London: Bahá'í Publishing Trust, 1912 ) pp. 21-25. This is certainly an highly inflated number for the population of Bahá'ís in 1911. The highest estimate known for the number of Iranian Bahá'ís during this period is one million, and this estimate is disputed. There were never more than two or three thousand Bahá'ís in Europe and America during `Abdu'l-Bahá's lifetime, and the number of Bahá'ís in other countries of the world was few. The current population of Bahá'ís is about five and one-half million worldwide. This was, indeed, `Abdu'l-Bahá's first public address. Quoted in an editorial, Evangelical Christendom (Sept.-Oct. 1911) p. 166. `Abdu'l-Bahá's address to the congregation at the City Temple can be found in `Abdu'l-Bahá in London, pp. 19-20 (reprinted from The Christian Commonwealth, September 13, 1911). Habíb Mu'ayyad, Khatirát-i Habíb, vol. 1 (Tehran: Bahá'í Publishing Trust, 118-128 B.E. [1961-71]) pp. 82-83. We are grateful to the Research Department at the Bahá'í World Center for bringing this reference to our attention. See especially, The Promulgation of Universal Peace: Talks Delivered by `Abdu'l-Bahá During His Visit to the United States and Canada in 1912, comp. by Howard MacNutt, 1982 Edition (Wilmette, Ill.: Bahá'í Publishing Trust, 1922-25 ); Paris Talks: Addresses Given by `Abdu'l-Bahá in Paris in 1911-1912 (London: Bahá'í Publishing Trust, 1912); `Abdu'l-Bahá in London; Juliet Thompson, The Diary of Juliet Thompson (Los Angeles: Kalimát Press, 1983); Agnes Parsons, `Abdu'l-Bahá in America: Agnes Parsons' Diary (Los Angeles: Kalimát Press, 1996); and Mírzá Mahmud-i Zarqání, Kitáb-i badáyi'u'l-áthar, vol. 1 (Bombay, 1914). Recent translations of Mírzá Adu'l-Fadl's [sic] work include: Miracles and Metaphors, trans. by J. R. Cole (Los Angeles: Kalimát Press, 1981); Letters and Essays, 1886-1913, trans. by J. R. I. Cole (Los Angeles: Kalimát Press, 1985); a facsimile reprint of The Bahá'í Proofs (Wilmette, Ill.: Bahá'í Publishing Trust,  1983). In the interest of simplicity and readability, all sublinear diacritical marks have been omitted from the transliteration which appears in this volume. The editors hope that this will make the text more accessible to the general reader.